Leftover corned beef hash is so simple to make and takes your leftovers to the next level! 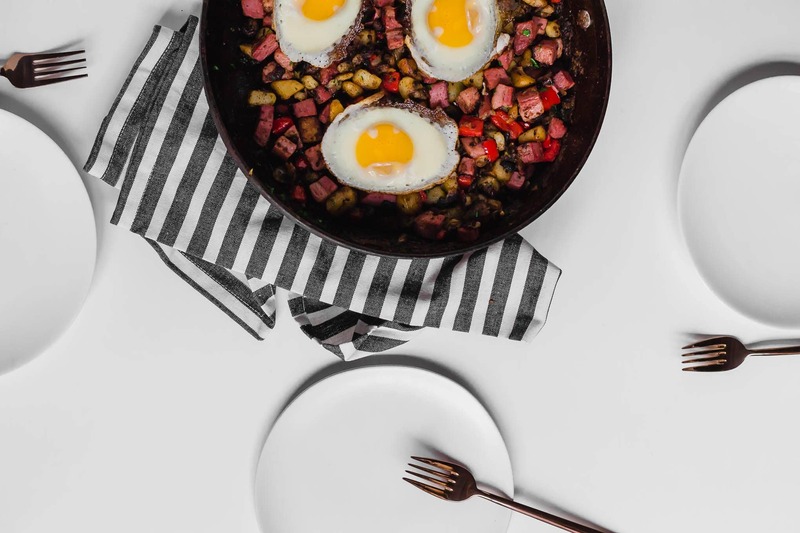 All you need is leftover corned beef hash and a few other ingredients to make this delicious gluten-free and dairy-free breakfast recipe. If you’re celebrating St. Patrick’s Day, you need to try this recipe! As St. Patrick’s Day is today, I would be remiss if I didn’t make corned beef hash. Is it just me or does anyone else find themselves buying the canned corned beef hash once a year and then say “never again” because of the over the top saltiness they experience only to do it all over again next year? You too? It would make me feel better if I wasn’t the only one. Seriously though, how much salt do they put in those cans? Bleh. I much prefer the kind you cook yourself. Nevertheless, I will most likely continue my tradition of eating corned beef hash once a year. Until next year, canned saltiness. Because now we’re making the good stuff! Luckily corned beef has been on sale at my grocery store for the past few weeks and I have not stopped eating it since! While you can most certainly cure your own beef to make corned beef, I took a slightly easier approach and purchased the already salted corned beef. I always check labels as a good gluten-free girl and the store brand was gluten-free! Spices and all. You can use whatever kind of corned beef you want for this recipe, just save some leftovers to make this leftover corned beef hash. Last week we made some corned beef and cabbage with dairy-free kale colcannon for dinner, which gave us some great leftovers for this recipe. I loveee how this leftover corned beef hash turned out! It’s salty (but not too salty), savory, crispy and full of flavor. I love big chunks of corned beef in this hash, but if you want you can pulse yours in a food processor to get that ground up texture you find from the can or at some restaurants. The potatoes get oh so crispy in the pan and the onions and bell peppers add a ton of flavor. Bell peppers aren’t traditional in corned beef hash but I just had to add them in mine. You can serve eggs on top of your corned beef hash or even add some shredded Irish cheese if you please. I ate mine as is and served my boyfriend his leftover corned beef hash with eggs on top. In my recipe testing, I made this recipe four ways – cooking the potatoes different each time. I’ll give you my preference in the actual recipe but I’ll go through the other ways for cooking the potatoes with some of the pros and cons of each. Use leftover potatoes. Okay, this is a no brainer. If you have leftover potatoes, use them up! I love repurposing leftovers for breakfast and this recipe is no exception. Just dice up the cooked potatoes while they’re cold and add them to the skillet. You won’t need to cook as long as the recipe dictates, because the potatoes are already cooked and we’re just looking to crisp them up. The only con of using this technique is that I typically don’t have boiled or baked potatoes with no seasonings on them, so it’s rare that I use this approach. Use frozen diced potatoes. Also a good method! Just find gluten-free frozen hash browns or diced potatoes in the frozen section at the grocery store. I just prefer using freshly cut potatoes because they only contain one ingredient, potatoes! The frozen kind has a few other ingredients in them, which is just not my preference. Partially cook the potatoes beforehand. There are a few ways to do this to cut down the time on the overall cooking process. You can microwave the potato whole for about 5 minutes (poke holes in it before microwaving), and then allow to cool and then dice. Another method is to cube the potatoes and add to a pot of boiling water and let cook for about 5 minutes, until tender. The last way is to toss the cubed potatoes with avocado oil or olive oil and bake in the oven at 350F for about 20 minutes. They’ll be super crispy this way and then all you have to do is toss with the cooked onions and bell pepper, and the remaining ingredients. There are many times I use one of these methods to partially cook the potatoes before adding to the skillet. I like it because it cuts down on the overall time for the recipe and the onions and bell peppers don’t get as browned waiting for the potatoes to get crispy. The only reason I don’t like it is another pot, bowl, baking sheet is needed as well as another form of cooking. If that doesn’t bother you, go for it! Toss the cubed raw potatoes right into the skillet and cook! So this is my preference and what I’ve included in the recipe. Yes, it does take a little bit longer as you wait for the potatoes to cook through and get tender. However, the potatoes are deliciously crispy this way and there’s just so much flavor. Any way you cook the potatoes, you’ll have a fantastic leftover corned beef hash at the end of it. I hope my notes were helpful for you guys! I really did try each of these ways just so I could pick my favorite method and provide you with different approaches to this recipe. If you have any questions or want more specifics about one of these methods, leave me a comment below and I’ll answer it! 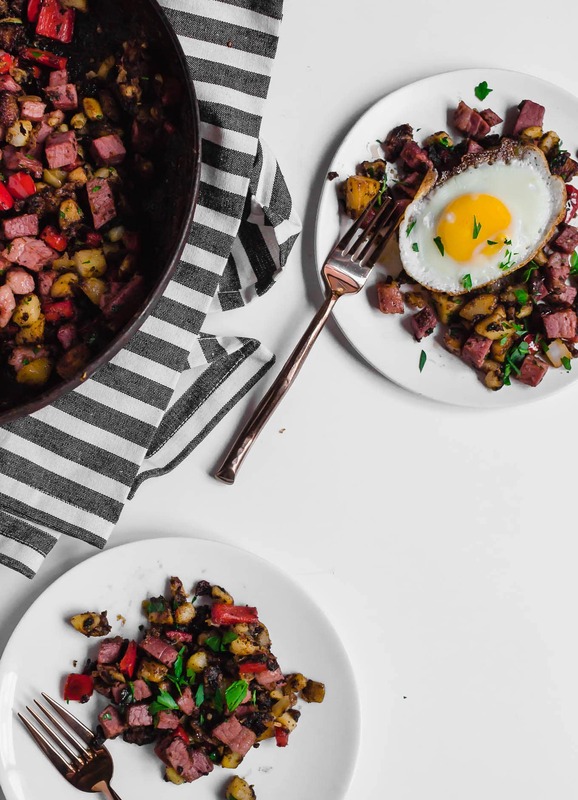 This leftover corned beef hash is a great gluten-free and dairy-free breakfast to celebrate St. Patrick’s Day. You can top it with eggs or eat it as is. It’s so good you’ll want to eat it all year long! Leftover corned beef hash is so simple to make and takes your leftovers to the next level! 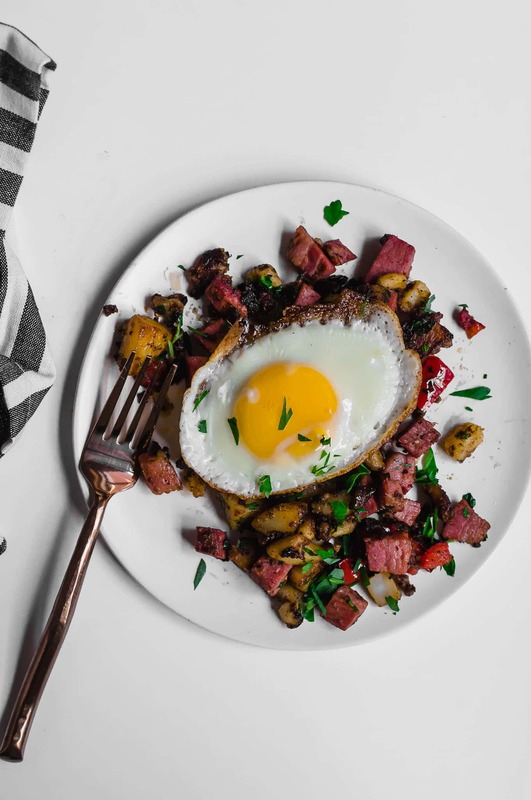 All you need is leftover corned beef hash and a few other ingredients to make this delicious gluten-free and dairy-free breakfast recipe. If you're celebrating St. Patrick's Day, you need to try this recipe! Add onions and cook for 2-3 minutes. Add bell pepper, and cook an additional 2-3 minutes, until onions and peppers are soft. Add garlic and cook for 1-2 minutes, stirring to ensure garlic does not burn. Stir potatoes into the skillet, along with salt and pepper. Cook for 15-20 minutes, until potatoes are tender and crispy. Stir every few minutes so that the onions and peppers do not burn. Stir in leftover corned beef, and cook until the corned beef is warm and crispy, about 3-4 minutes. Garnish with chopped fresh parsley and serve.